Drel Chung Dön Sal Nyingpo, Essence of Clear Meaning, A Short Commentary on the Sharp Vajra of Awareness Tantra (Tib. ཤེས་རིག་རྡོ་རྗེ་རྣོན་པོའི་རྒྱུད་ཀྱི་འགྲེལ་ཆུང་དོན་གསལ་སྙིང་པོ་, Wyl. shes rig rdo rje rnon po'i rgyud kyi 'grel chung don gsal snying po) is a commentary on the Sherik Dorje Nӧnpo Gyü Dzogchen tantra of Dudjom Lingpa, written by his major disciple Pema Tashi. This [treatise] is a uniquely marvelous sign that the time is ripe for meditative experiences and realizations due to the training of many previous generations in the unsurpassed Early Translation School, the Nyingma tradition, which is the essential Dharma of the swift path to Buddhahood in one lifetime. Here, I shall present to the best of my ability a concise commentary on the ‘Sharp Vajra of Awareness Tantra’, a synthesis of the quintessence of the great mystery of the Mantrayana, which correctly reveals the nature of Trekchö and of Tögal. Alan Wallace wrote  that 'To effectively practice the instructions given in the Sherik Dorje Nӧnpo Gyü (‘Sharp Vajra of [Conscious] Awareness Tantra’), we must rely upon its detailed commentary, ‘Essence of Clear Meaning’. 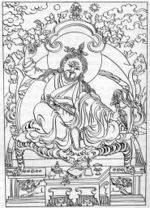 Dudjom Lingpa’s disciple Pema Tashi is the first-named requestor of the ‘Sharp Vajra of Conscious Awareness Tantra’ itself. Although he is considered the author of this commentary, his role in modern terms might have been closer to that of a compiler and editor.’ And that ‘In the colophon, he described it as the memorized oral teachings of Dudjom Lingpa, which he set down into writing. The highly condensed teachings of the root tantra are explained with definitive verses from the sutras, tantras, and famous masters along with Dudjom Lingpa’s oral explanations and quotes from his teachings, especially the Enlightened View of Samanthabadra’ and the ‘Vajra Essence’. This pure vision of the great treasure revealer Lama Düdjom Dorje Trolö Tsal is a set of Dharma teachings that arose from the treasury of space. This commentary to the Sherik Dorje Nönpo Gyü was taught to a few Dharma friends near the hermitage Drak Yangzong of the Second Buddha Orgyen [Padmasambhava]. On that occasion, the memorized oral teachings of the venerable, great treasure revealer Düdjom Dorje were held as supreme, and Pema Manga, with devotion for this foremost path, wrote them down so that they would not be forgotten. Alan Wallace, Dudjom Lingpa’s Visions of the Great Perfection, Wisdom Publications, 2015, volume 1, page 39-138. ↑ Alan Wallace, Dudjom Lingpa’s Visions of the Great Perfection, Wisdom Publications, 2015, volume 1, page 41. ↑ Alan Wallace, Dudjom Lingpa’s Visions of the Great Perfection, Wisdom Publications, 2015, volume 1, page 22. ↑ Alan Wallace, Dudjom Lingpa’s Visions of the Great Perfection, Wisdom Publications, 2015, volume 1, page 137. ↑ Lama Düdjom Dorje Trolö Tsal is a name of Dudjom Lingpa. This page was last edited on 9 February 2018, at 07:58.